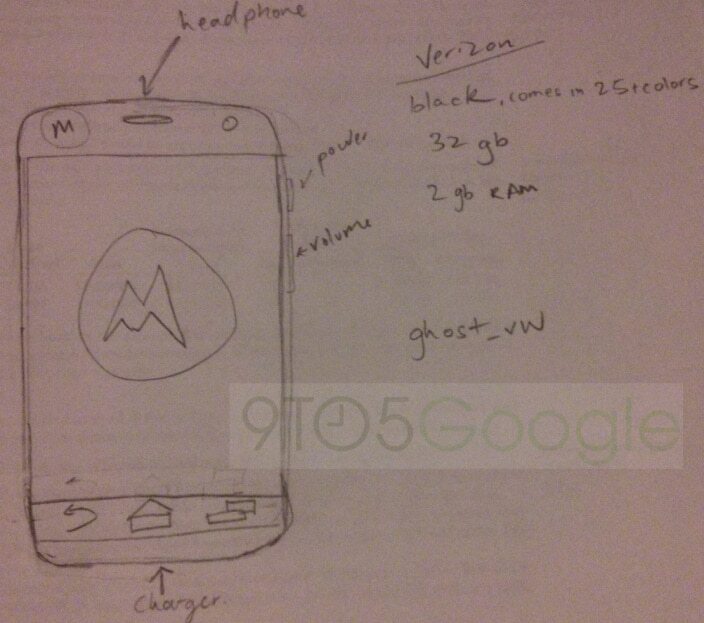 Tonight seems to be full of Motorola X Fon rumors. Tonight, 9to5Google is reporting on some inside information they've received from their source, who saw the Verizon LTE version of the device. This is in addition to the leaked images we saw earlier today. Reports are that the X Fon will release on all 4 US carriers and be available in 25 different colors. They also note that the bottom bezel is ridiculously small, compared to other phones. The phone that he saw supposedly had 32GB of storage, 2GB of RAM and a 720p display, but that might be bumped to 1080p. It was also running Android 4.2 and it's codenamed 'ghost_vw'. So basically, what 9to5Google is thinking here is that this is the successor to the Droid Razr M which launched last fall on Verizon. It had many of the same qualities as this device. Which is said to have a 4.3-ish inch display along with crazy long battery life. Then there's also the part about the 25 colors and protection. They are also thinking that Motorola is going to offer some protective skins or plates that will be available in 25 different colors. We know that about 80-90% of customers purchase protection for their phone when they purchase their phone. So making them available at launch is a great idea. And you can theoretically provide almost an industructible, and perhaps water-resistant layer on your brand new phone. We also learned that the codename for the X Fon in general is 'ghost'. And after seeing that the Verizon variant is 'ghost_vw', it'll probably be similar for the other variants for AT&T, T-Mobile and Sprint. But we don't know for sure right now. It's getting real interesting for sure. We'll have to keep our eyes and ears peeled to see if we hear or see anything else about the X Fon.